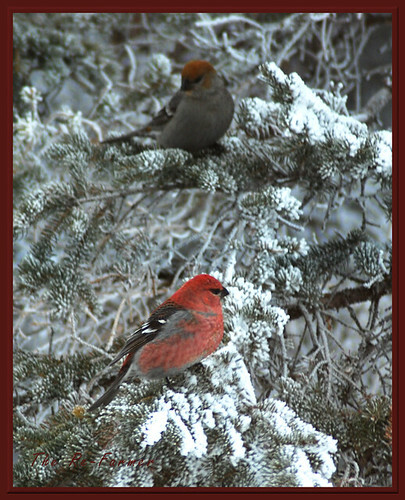 This male and female pine grosbeak pair on the frosty trees are like something off of a Christmas card! ← Critter of the Day: Queen of the Trees! Do you realize some people these days don’t know what a postcard is!! Boy, we are getting old! It is a damn good picture! Maybe for a screensaver…no wait …I don’t think they do that anymore… desktop….calendar….um. pinterest! Ha, I have got one!! I did actually think of that about the postcard when I came up with the title. Didn’t think of a screensaver, though. Too funny! Excuse me while I go tend to my pet mastodon.